This article gives an overview of three recommended web services for curating your online professional development. If you already read a lot of content using a browser, this article shows how to be more organized and efficient by using a web service with built-in workflow tools for sharing information and more. Reading news and blogs feeds is one of the easiest ways of increasing your online professional development. Feeds are available through a technology called RSS, which is built on XML. RSS grabs the latest updates to a blog or news site and feeds them into a news aggregator application (also known as a RSS reader). 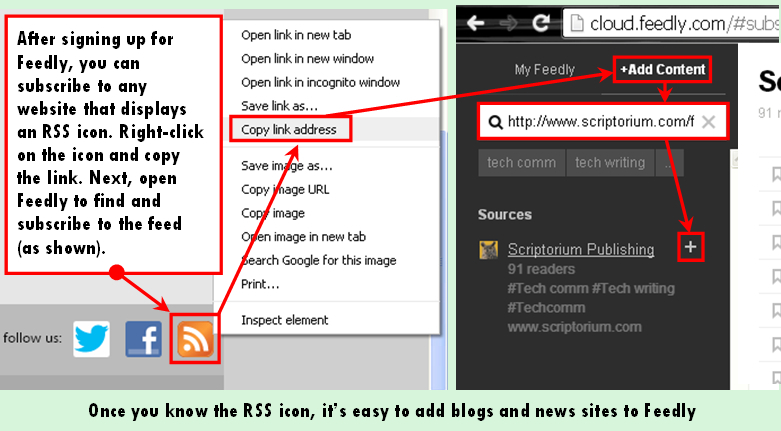 The user of the RSS reader can then control how the content is presented. 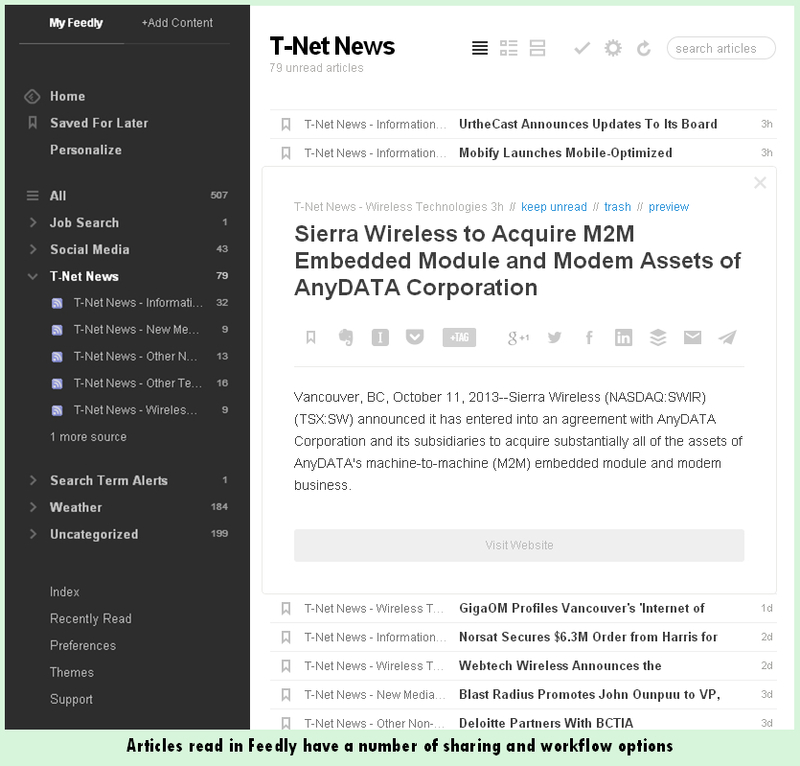 Now that Google Reader is gone, Feedly has emerged as the top RSS reader. The ability to synchronize across all your devices and use Feedly as a workflow tool – for example, to mark items as read and share items on multiple social media accounts – make it more powerful than reading the same content with a browser. Content read in Feedly can be shared with almost any social media account directly through Feedly, or via a web service such as Buffer or IFTTT (stands for If This Then That). For advanced users, Buffer also offers click stats and specific timing for posts, while IFTTT can automate data flows between Feedly and social and nonsocial web services, such as Dropbox and Evernote. Feedly is free, but there is a paid version ($45/yr or $5/mo) that has a handful of extra features, such as the ability to search within feeds. There is one slight drawback: the ability to add comments or like posts isn’t tightly integrated, but can be done with a couple of clicks. Recently LinkedIn has become better for sharing knowledge, as opposed to posting news and information content, though there is a lot of that too. Each minute, more than 200 conversations take place in LinkedIn Groups across the platform. This is in addition to discussions happening within the Influencer Program, a relatively new network of experts and thought leaders whose posts receive special syndication on the homepage. This year, LinkedIn has taken steps to encourage deeper and more ongoing conversations by adding social media-style features. Members can engage with each other more by liking and mentioning each other in comments – this used to be limited to status updates. You still can’t mention other members in groups, though you can reply privately. After mentioning someone or liking their comment, LinkedIn sends an instant notification to the other member. This has increased the number of conversations taking place in real time. Also, the LinkedIn mobile app now includes a section for groups, making it even easier to keep the conversation going in real time. In addition to adding features, LinkedIn also changed the design of discussion pages, to make it easier to read lengthy comment threads and see at a glance which comments were most liked. Plus, they made a few less obvious changes to improve content. For example, they removed the ability to automatically create new discussion topics from a RSS feed. The issue was that it tended to increase the amount of news and information content over questions that inspired conversation among group members. Hootsuite provides the ability to efficiently manage several dozen information streams from a single dashboard. It was originally created for marketers and community managers to send out messages over a variety of social media and monitor click stats, but has grown to include bloggers, journalists, business owners, and others. add your LinkedIn account and up to 50 LinkedIn groups. Once setup, you can interact with posts by commenting or liking from within Hootsuite. add blogs and RSS by installing the RSS Syndicator App, one of Hootsuite’s many free add-in features, though commenting on posts requires extra clicks (the same as it does with Feedly). do almost anything you can do in Twitter and more, such as search for local posts on a specific topic using GeoCodes. connect to accounts on Facebook, Google+ (pages only), WordPress, Blogger, Pinterest, Gmail, and more. Hootsuite has both free and paid ($9.99/mo) versions. The free version has limited features, including how many information sources you can add before you have to upgrade. Feedly is a great service if you like to keep up to date using blogs and news sites. Its unfussy, intuitive design makes it best of breed among RSS readers. The built-in workflow tools are great for busy professionals and integrate well with many other popular and up and coming web services. LinkedIn Groups are a good choice if you get that a lot of professional knowledge comes from talking to people who do similar work. In addition to exploring ideas and learning from experts in different fields, you can use groups to boost your credibility and visibility within your network by posting articles and participating in discussions that demonstrate your skills and knowledge. If you need a service that is capable of doing more than Feedly and LinkedIn combined, Hootsuite offers an impressive set of tools. It’s especially good if you need to manage a lot of social media activity. 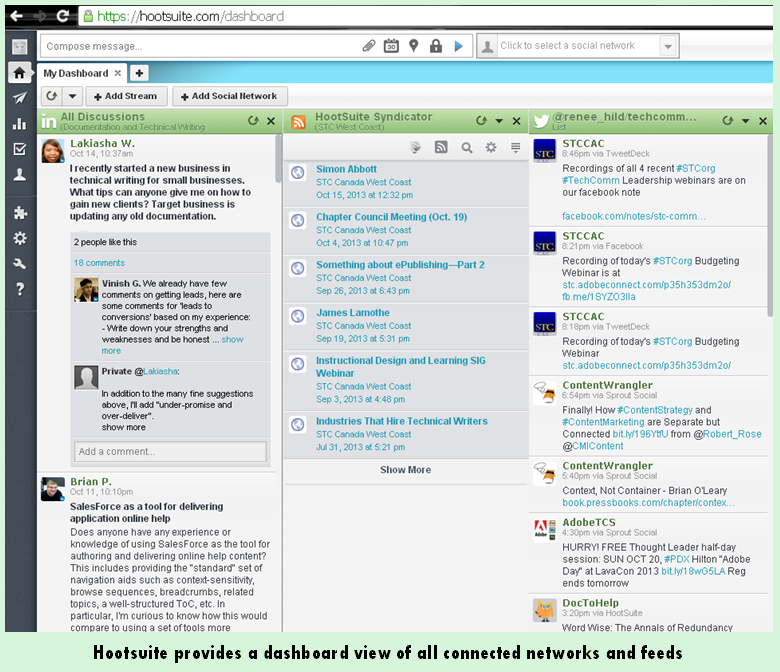 HootSuite enables posting to all supported networks as well as monitoring of each connected network. All three services can be used on multiple browsers and devices. However, Feedly struggles to support users of older versions of Internet Explorer and is currently best viewed on Chrome, Firefox, or Safari. There is one small issue to be aware of that applies to all of these services: set up can take a while. Be prepared to spend a little time getting it right. Once you’re set up, you’ll have a great tool (or tools) for curating your professional development. When I started researching this article, my first question was where were technical writers having conversations with each other online. As a new technical writer, I planned to use the answer to drive the majority of my professional development activity. The answer wasn’t hard to find. Technical writers were recently polled about where they were having conversations online by TechWhirl and the top response was LinkedIn Groups (see http://techwhirl.com/techwhirl-poll-wheres-conversation-tech-comm/). It’s a small sample size, but the results are believable when you consider that there are about 2 million LinkedIn Groups and more than 200 conversations happening every minute. I was already a member of 50 groups when I started this article. That is the maximum allowed for a free account. I found my groups by looking at other technical writers’ profiles (and added to that about 25 more groups that reflected other interests). These are just a few of the groups I found and liked: Software User Assistance, Agile Technical Writers, Documentation and Technical Writing Management, Content Strategy, and Society for Technical Communication. Over time, I learned that there isn’t nearly enough time in the week to follow 50 groups. This led me to do some analysis on my groups. There were some I didn’t need to follow on a regular basis, yet didn’t want to fully withdraw from. For instance, the MS Word Helpers group is a great resource when I need help fixing a complicated Word problem, but not a subject I need to follow closely. Identify which groups to follow closest. No more than eight is recommended. Visit each of these groups one by one to change your settings (see http://help.linkedin.com/app/answers/detail/a_id/2918). Turn ON “Send me an email for each new discussion” and turn OFF “Send me a digest of all activity in this group” (which is the default). Confirm that these emails will be sent to your preferred email account, preferably one that lets you create a rule to put emails from one sender into a dedicated folder, so LinkedIn emails don’t clog your inbox. Save your new email settings. Adjust or turn off digest emails for any remaining groups that you subscribe to. 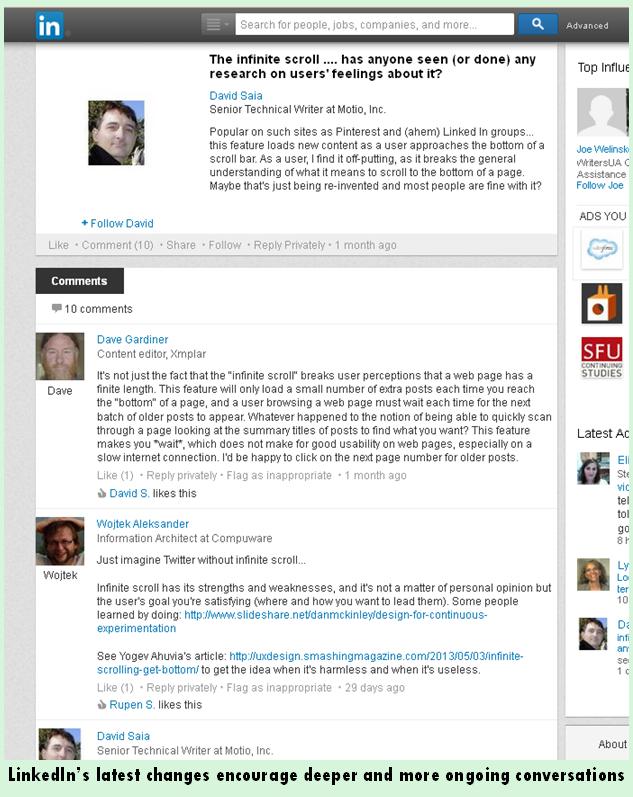 You can do this from your Privacy and Setting page (see http://help.linkedin.com/app/answers/detail/a_id/2116). Wait a few days for all changes to take effect. After participating in a few discussions, I noticed a difference in who sees what. For example, my first degree connections can see (from their homepage) my activity in open groups and any member-only groups that we have in common. Also, while member-only group discussions are only visible to other members, open group discussions are fully visible, searchable, and shareable on the web. I make slightly different choices now, knowing for example that if I hit the like button or add a comment, I could be broadcasting it to my entire network. This entry was posted on Wednesday, October 23rd, 2013 at 1:00 pm and is filed under Community. You can follow any responses to this entry through the RSS 2.0 feed. You can leave a response, or trackback from your own site.